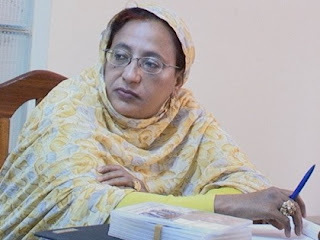 Mauritanian filmmaker Mariem mint Beyrouk, speaks about cinema in Mauritania, the Association of Mauritanian Women of the Image, and her work as cineaste. Mariem please begin by talking a bit about yourself. My name is Mariem mint Beyrouk, I am a director and cineaste from Mauritania. In 1983, I joined the newly created Mauritanian television (TVM) after my first training internship in France at FR3 in Bordeaux and at TDF in Paris. Later I studied at the CAPJS (African center for advanced training of journalist and communicators) in Tunis and the training center of ASBU (Arab States Broadcasting Unit) in Damas. While there, I attended workshops facilitated by French, Arab and Belgian instructors. I like my work very much, which I consider to be the greatest profession in the world. I direct several political and cultural programs at the TVM where I am head of a rather important unit. I am also president of the Association of Mauritanian Women of the Image, which brings together female directors, camerapersons, script supervisors, etc. Is there a cinema culture in Mauritania? Cinema did exist in Mauritania along with several cinema houses, and people went regularly to the movie theater. However, at the beginning of the 1980s, with the emergence of television in Mauritania, it started to diminish until it disappeared. Cinema houses closed, replaced by video and television. Television viewing is a favorite pastime due to satellite and information technology. However, in the last several years La Maison des Cinéastes (The House of Filmmakers) was created, which has given a new momentum to cinema. In addition, it organizes an annual festival. You direct several programs at the Mauritanian Television, what are some of the themes and programs and their reception by viewers? Yes, my television programs are well received. In fact, according to a TV poll, Kelimat we anguam, a cultural program, and Eraey etebi a program about health, received first-place rankings. In 2007 I participated in the series “Femmes Battantes 2” (Women Go-getters 2) co-produced by CIRTEF and the TV Suisse Romande, which entailed scriptwriting and set viewing at the CIRTEF centre in Niger, and editing in Cameroon. My films have been well received by the public, especially Les chercheuses de pierres/Women in search of stones (2008), which won a prize at the Taille XL Festival in Brussels. It was an honor for me and for my country, as it was the first time that a Mauritanian television director brought home a prize from outside of Mauritania. Chercheuses de pierres is about a group of women who make jewelry and artwork from stone, for which they must travel alone in the desert to collect—a journey which may take several weeks. The Association of Mauritanian Women of the Image is a very important organization! How many women are involved in it? What are its activities? Our objective is to raise women’s consciousness about health issues, women in general, mother-infant health, the excision of girls, marriage of adolescent girls, etc. During the last few years, women have begun to show interest in filmmaking because there was a tendency to only pursue journalism. The Association of Mauritanian Women of the Image is comprised of all the women working in technical and artistic fields at the TVM. The Association has more than one hundred women and most recently, young directors formed by La Maison des Cinéastes have joined. We have considered organizing festivals and meetings with our female counterparts throughout the continent but we do not yet have the means to do so. Works in progress, future projects? As for the future, I have many projects, including a documentary on the Imraguens, a Mauritanian fishing community who live on the northern coast. Among the fishing activities is the preparation of the fish, done by the women. Interview and translation from French to English by Beti Ellerson, August 2011.